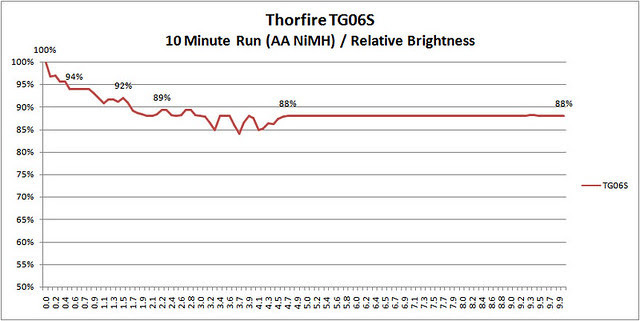 I had the opportunity to evaluate the new Thorfire TG06S and was provided a copy for review by Thorfire. 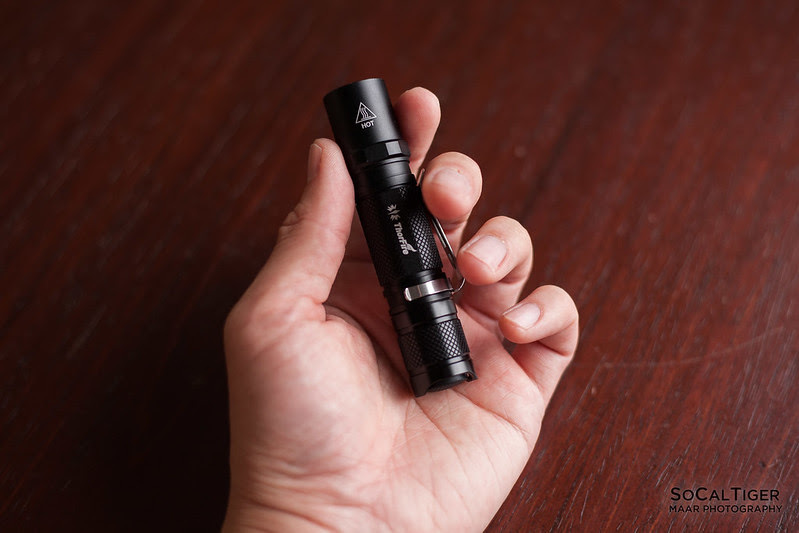 I was really looking forward to this because I am a big fan of EDCs which accept common AA and AAA batteries in addition to having a 14500 option (for AA lights). 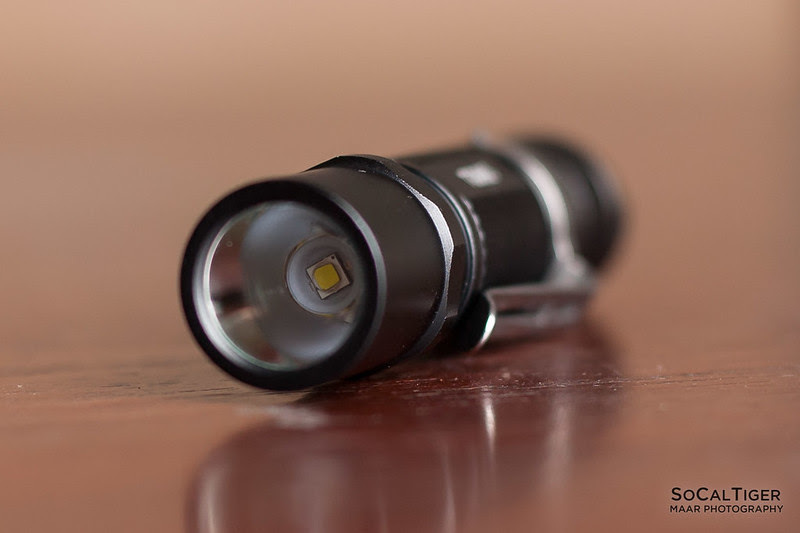 Extremely Bright Mini Light: TG06S flashlight uses single XPG2 LED, gives out MAX 500 lumens when powered by premium 14500 battery(NOT Included). 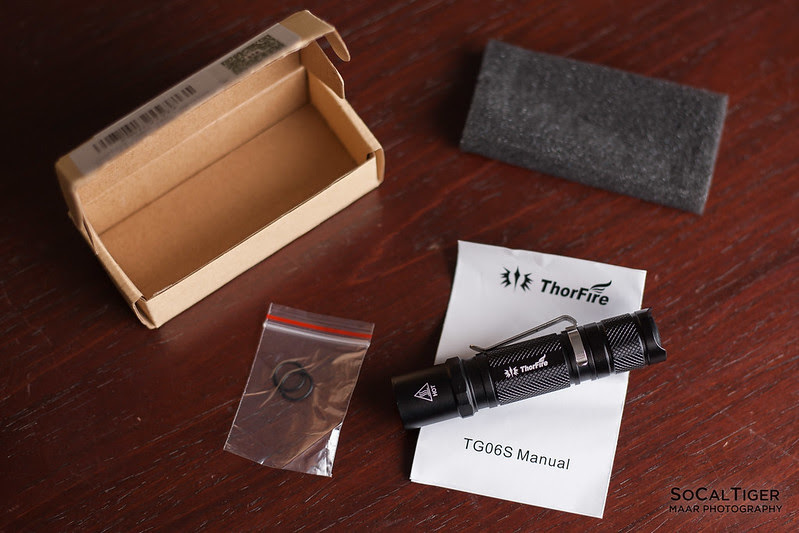 Package Includes: 1x TG06S flashlight; 2x spare O rings; 1x manual and helpful customer services. 1. 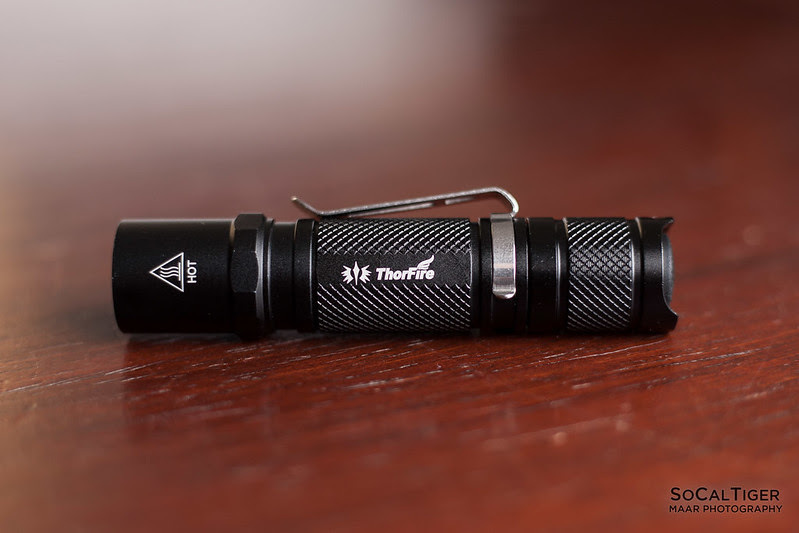 The lightweight makes the newly designed ThorFire TG06S fits easily into your pocket, backpack, purse, or tool bag. 2. With one considerate metal clip, you can clip it to your shirt pocket. 3. 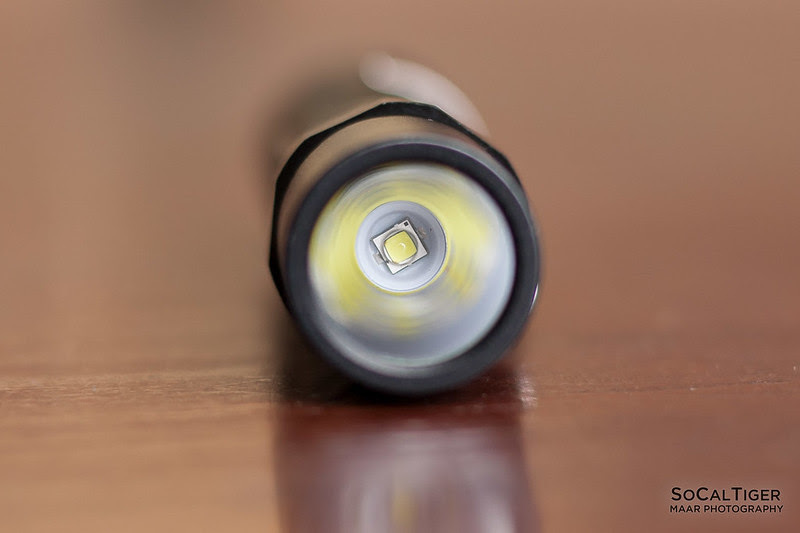 It is great for multiple indoor and outdoor applications including searching, camping, hiking, or even use as an emergency light when suffering a power outage. 4. One cooler thing is that the O-ring behind the lens glows in the dark, which makes it easy to be found in the dark. ThorFire promise to offer 40 days money back and worry free customer services, if you encounter with any question, please contact us. The TG06S arrived in a small "no frills" cardboard box. 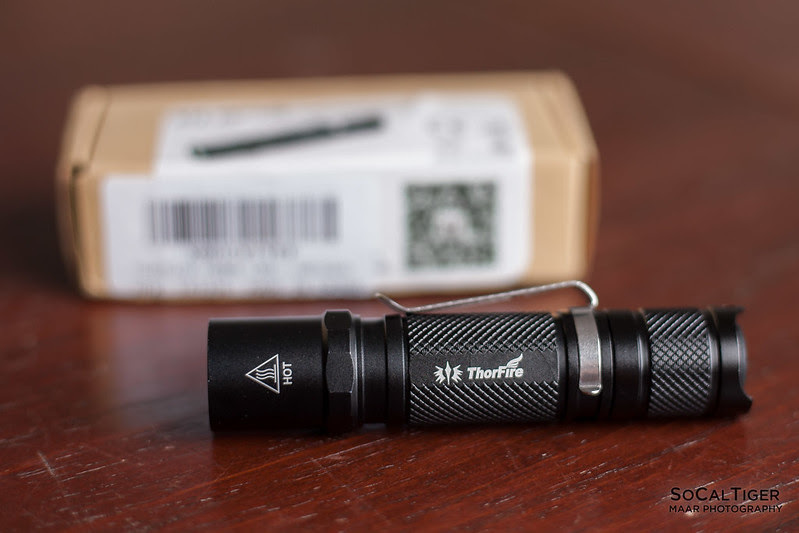 The light itself was in a small bubble-wrap tube along with a pocket clip (installed), 2 spare O-rings and the manual. The contents were sitting on top of black foam for additional cushioning during transport. The packaging is more than sufficient in addition to the mailer packaging. There is no significant risk of damage or scuffing to the light during delivery using this packaging. This packaging is better than I have seen for some other lights (in other lights I've experienced scuffed finishes from poor packaging). 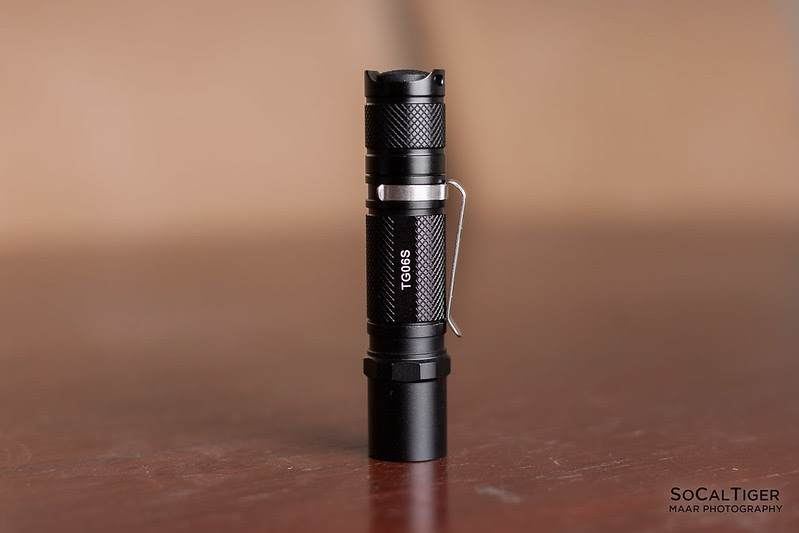 The TG06S has smooth black anodizing. The anodizing was applied well and my copy did not have any notable defects in the finish. In many pictures, the finish looks glossy black. However, in real life, it is a nice non-glossy sheen. I feel that this finish looks very nice and professional in quality. This is the level of quality that I expect at the price point of this light (many cheaper lights have an overly glossy or painted-on appearance). The body of the light is a tube design which is cylindrical with the exception of the base of the head which has a hex-cut ring. The hex-cut is smooth with no sharp edges and transitions smoothly and cleanly to the tube. This feature is a nice addition as it adds character to the appearance of the light as well as practical roll-resistance. The front and rear threads are square and very smooth. The tail threads much smoother than my Nitecore but not quite as smooth as my Convoy. The tail thread is anodized to allow for mechanical lock-out. 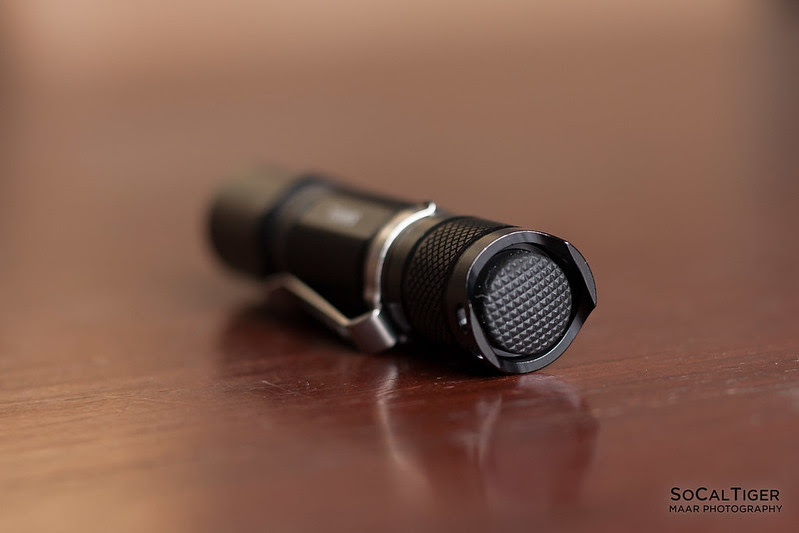 The TG06S includes a pocket clip, which was preinstalled on the tail end for carry with the light facing down. 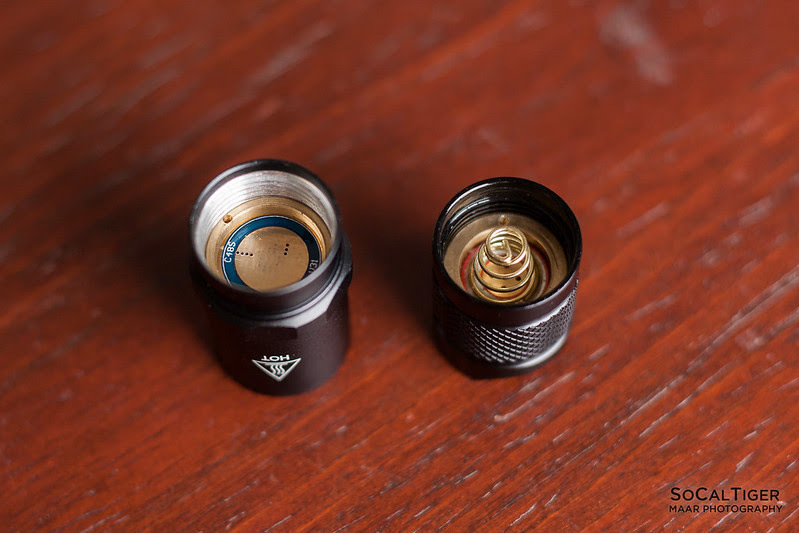 The clip can also be installed on the head end for facing the light outwards (such as if you wanted to install the light on the bill of a baseball cap). The clip is secure and would be relatively hard to accidentally remove. Keeping the clip installed also adds a significant level of roll-protection. The TG06S can tail-stand on a smooth and level surface. However, because the contact surface of the ring on the tail is less than 50% of the ring's potential diameter (it is not a complete circle), it may fall on an uneven surface and can be disturbed by movement. The light uses a standard reverse-clicky in the tail which utilizes full and partial presses. There is no mode memory so the light always activates on High. To turn the light ON or OFF, the tail switch is depressed fully. To advance modes, the tail switch is depressed partially (light press). To activate strobe (hidden), the tail switch is depressed partially twice in rapid succession. 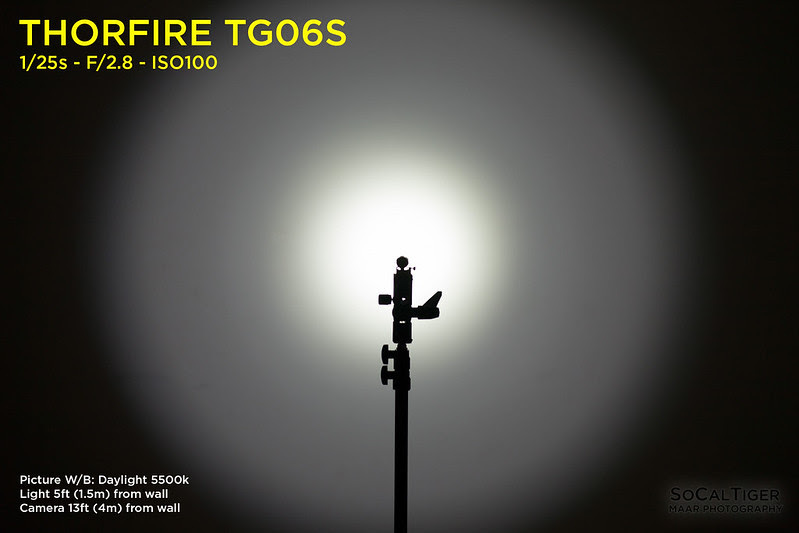 The TG06S can be powered by either lithium-ion 14500s (INR, IMR, ICR, etc.) or common AAs (NiMH, alkaline, etc.) The highest output will be achieved using lithium-ion 14500s. When using AAs, I recommend using rechargable NiMH batteries such as Eneloop because these rechargables will not leak the same way that alkalines do. If using alkalines, be sure to replace them frequently especially once they are drained. Alkalines are most likely to leak in hot environments (like in a car) or when drained. 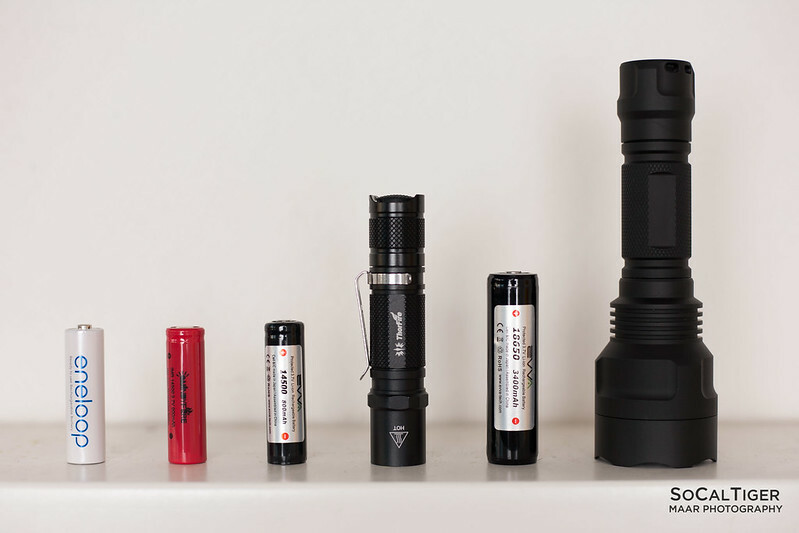 For long-term storage such as a light left in a car or emergency kit, you may also use lithium-primary AAs (ex: Energizer L91). 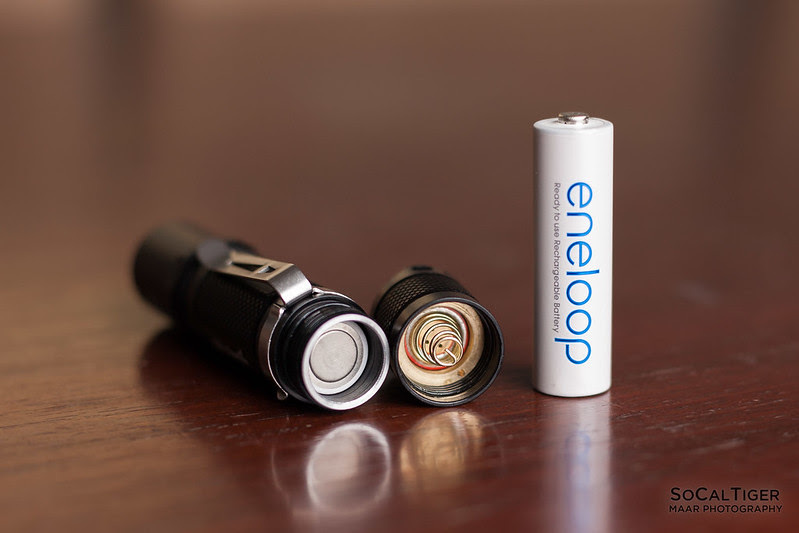 The 2100mAh LSD Eneloop AAs fit fine with room to spare on the tail spring end without putting too much pressure on the spring. I do not have the high capacity 2550mAh Eneloops (which are physically wider) to verify fit. The un-protected Windyfire 14500 IMR fit fine. 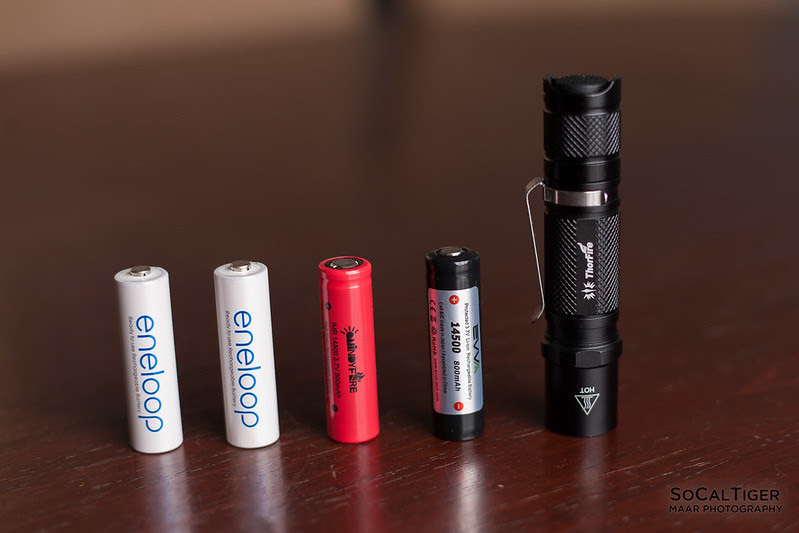 Protected Batteries: The EVVA Protected Sanyo UR14500P fits completely fine length-wise at 53mm. 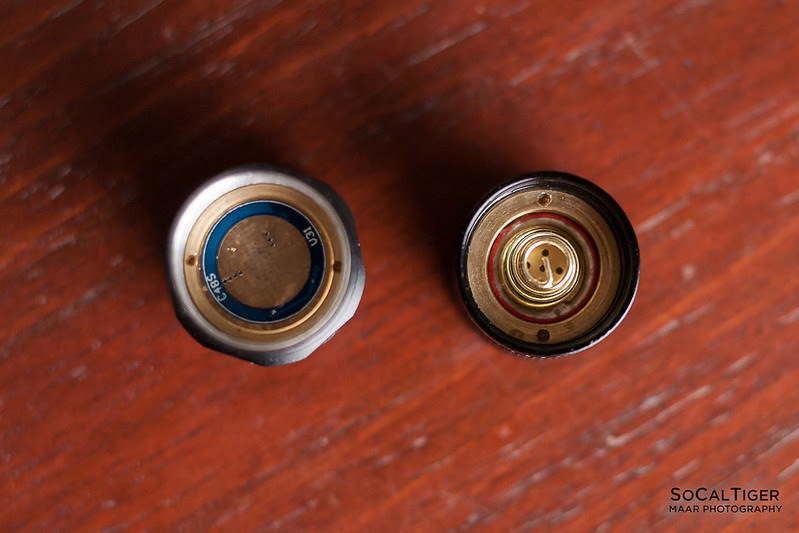 However, the width provides a little bit of resistance when inserting or removing the battery. The width is not concerning. However, removing the battery required either shaking the light or removing the head to push from either side. Button vs Flat-Top: Either button-top or flat-top work fine. The positive contact is flat. The negative contact is a firm spring. I measured light output using a quasi-integrating sphere. Using the Windyfire 14500 IMR battery gave roughly 20-25% more output than using the EVVA Protected Sanyo UR14500P. Current measurements were done at the tail cap using a DMM. Just for giggles, I threw in a comparative measurement of an old 4D incandescent Maglite. 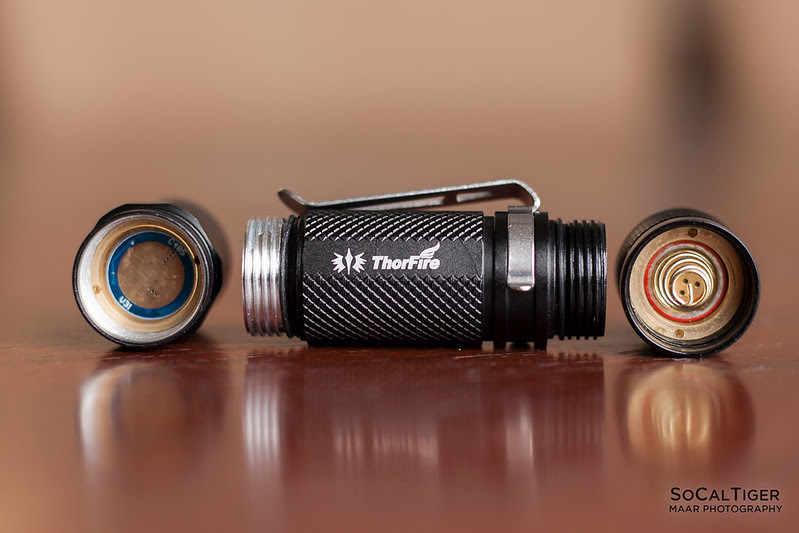 The TG06S is 8 times brighter than the Maglite when powered by a 14500 and just over 2 times brighter when powered by 1xAA. The TG06S driver does use PWM (Pulse Width Modulation). 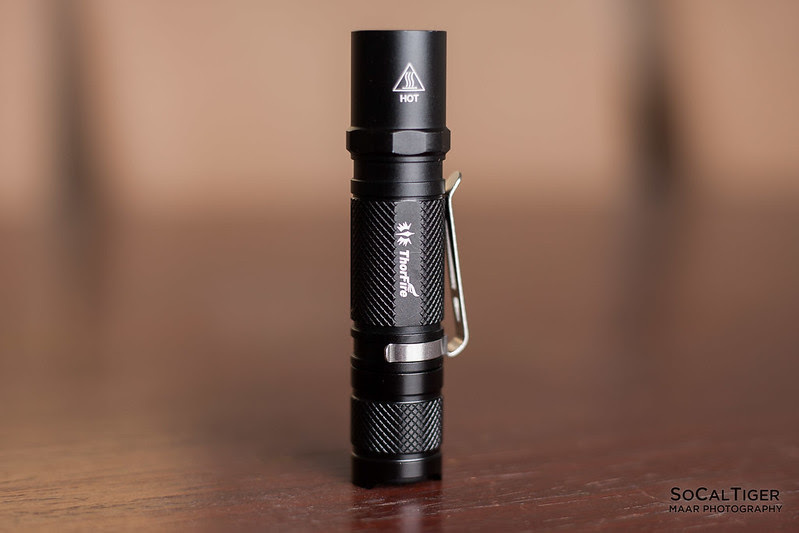 This light uses PWM in ALL modes EXCEPT full-power with AA batteries. Personally, I am not sensitive and did not notice it in practical use with this light. For my use, the frequency was fast enough that it is not an issue. The frequency appears to be slower at lower output. Moderately Throwy. 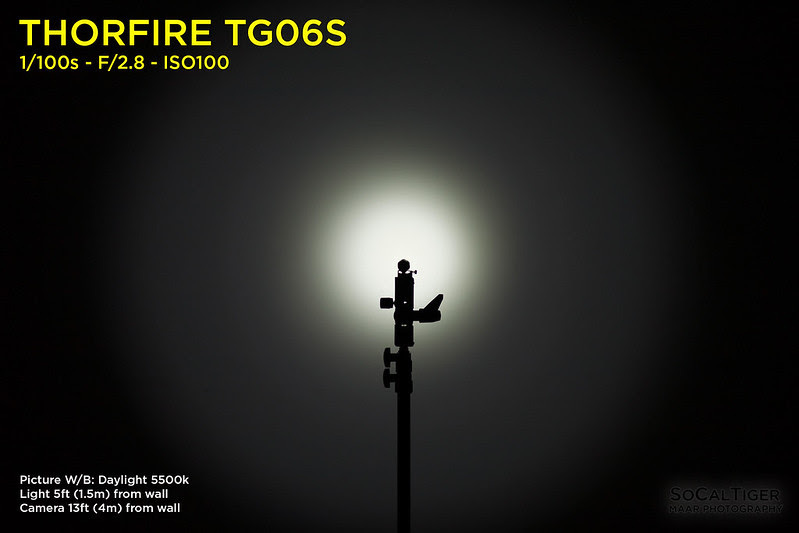 The TG06S uses a domed XP-G2 combined with a polished reflector so the hot spot is relatively tight with a somewhat defined corona that transitions nicely with a reasonable amount of spill. I estimate that the color temperature is right in the neighborhood of 5500K. When white-balanced in Adobe Lightroom against "Daylight 5500K", the beamshots appear neutral. The light appears pure white in practice. Personally, I would love if they also had an option for a warmer tint in the neighborhood of 4000K. 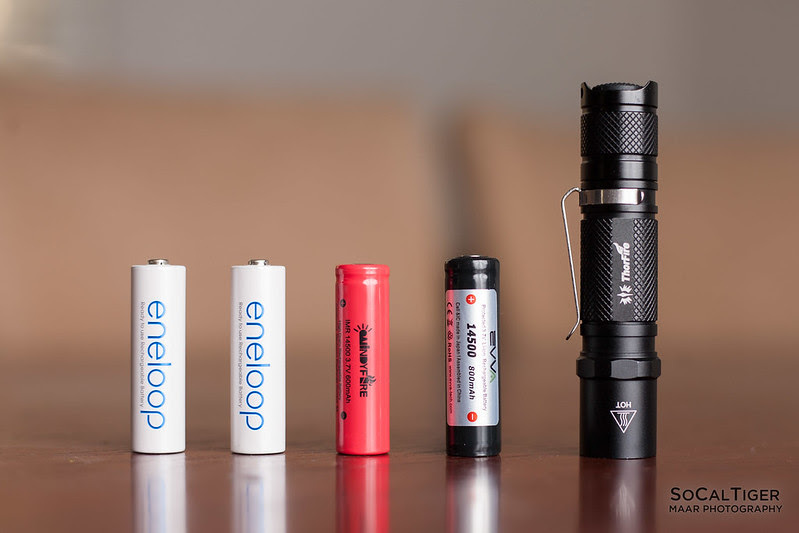 When using an Eneloop AA NiMH, this light exhibited a gradual ramp-down of roughly 10-12% from activation during the first 2 minutes which is not noticeable during use. After that, this light does not appear to step-down any further during the first 10 minutes. 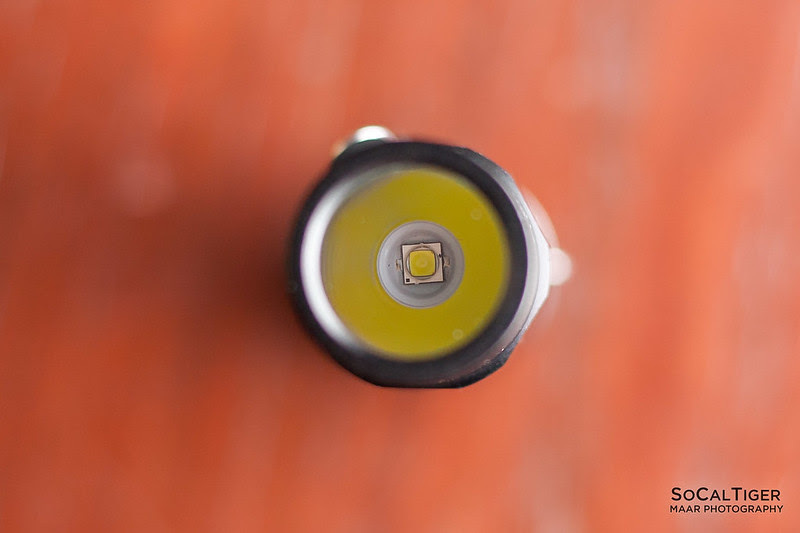 Even when powered by AAs, due to the small form-factor, this light becomes hot at the highest setting if you are using it for extended periods of time at room temperature. I would not leave this light on unattended with a lithium battery. 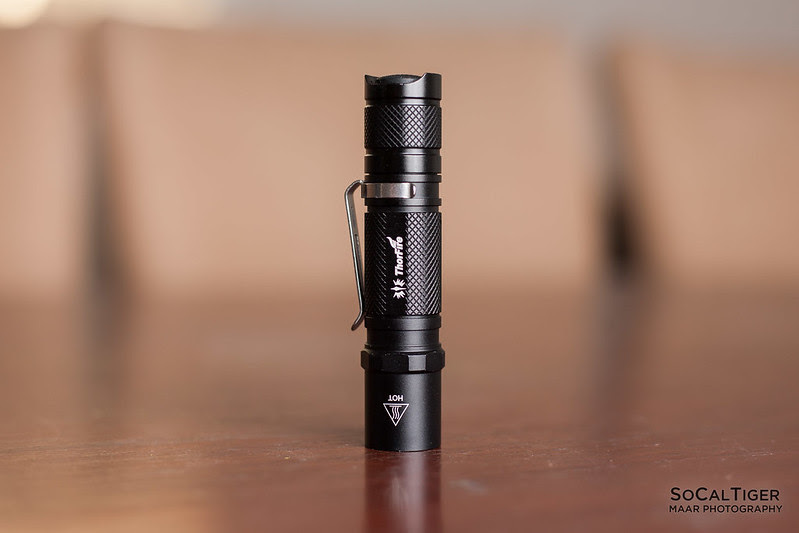 Like most powerful EDC lights this size, they are designed to be used briefly if at full power. The tail-end can be mechanically locked-out with just a slight twist thanks to the anodized tail threads. There is no electronic lock-out. I recommend locking out the light if there is a possibility of accidental activation. 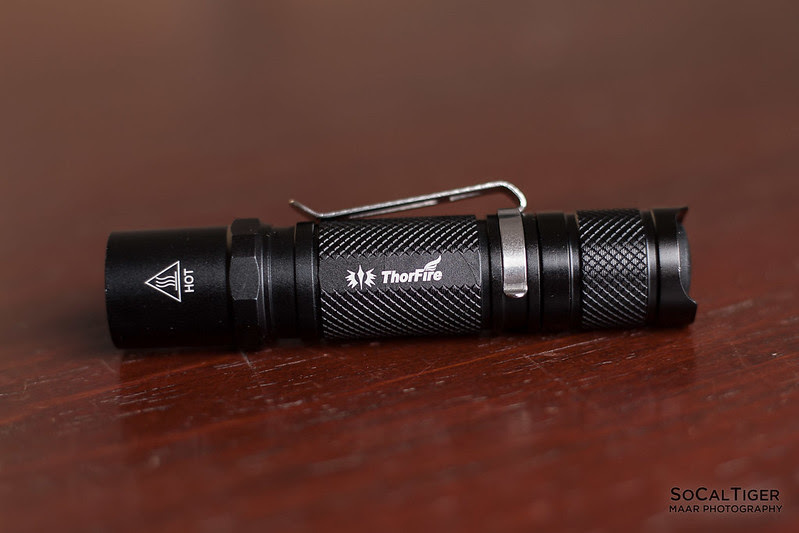 This is a good well-built AA/14500 light. The body is light and thin and would be good for EDC. The finish looks excellent, is clean and my copy had no defects. The modes are well-spaced with a perfect moon setting and a hidden strobe mode. The beam profile is moderately throwy and the color is cool white. Got this one a week ago and like it, but the moonlight seems to be higher output than the old model. Thanks! I don’t have the old model to compare it to but I thought that the tint was great. Definitely a good EDC IMO. With a 14500 the High is great to impress muggles with given the size. Thanks for the nice review. 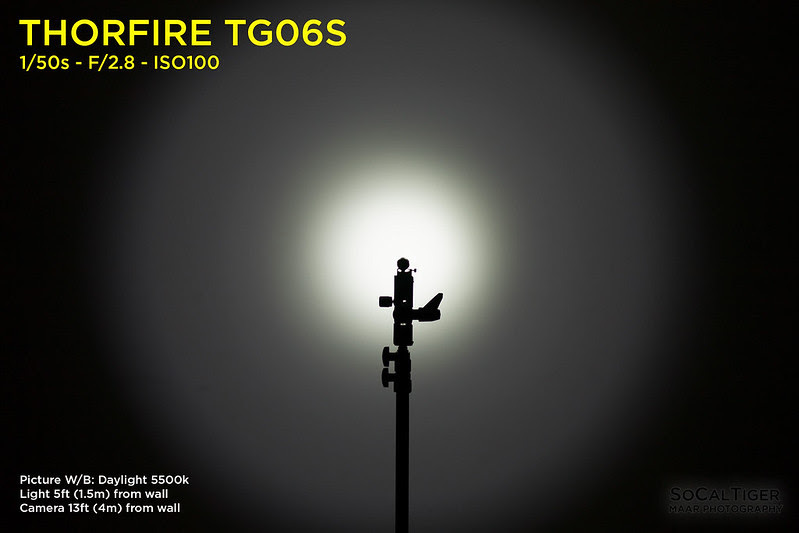 Now the TG06S is on big deals to all BLF friends. Use this coupon code (MQHZYUZC ), you could get one TG06S for ONLY $10.99. Nice thorough review SoCalTiger! Looks like a good EDC. I was really interested in this light, but PWM is a no-go for me. Otherwise, everything else looks great. If it were constant current, I would buy several. Thanks for the great review. I’ve been using one of the older TG06 models as EDC, for over a year. It came up missing a couple of weeks ago, and really miss it. 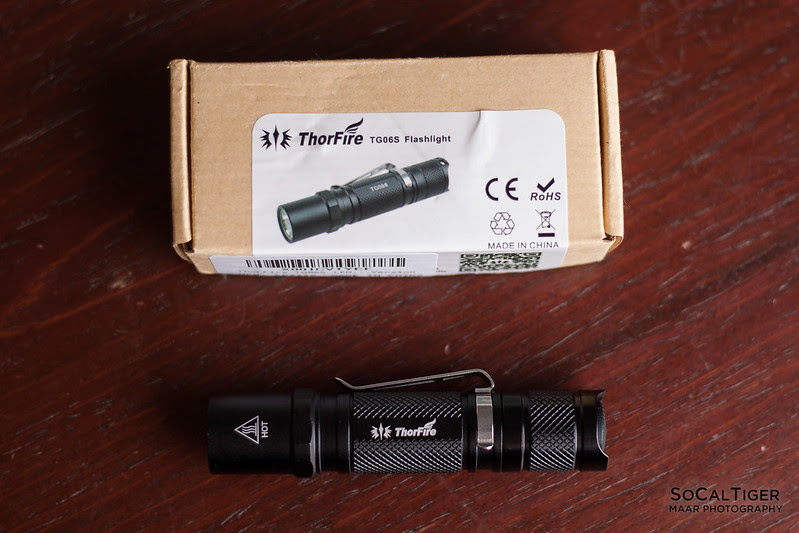 With the offer from Thorfire, I will have the new model on Monday. The older model I believe only used PWM on low, but I’m not that susceptible, so it works well for me. I think the tail threads are anodized to prevent wear and provide smoothness, not for lock out, because you don’t need lock out with a reverse clicky switch, because it’s hardly possible to accidentally turn it on and there is no parasitic drain when off. I said that because i have some lights with bare aluminum threads, and when you lubricate them (silicone grease), the aluminum seems to dissolve a little and you get that grey goo as a result, which doesn’t help making it go smoother..
Candle wax works better though, but is a little hard and crumbly. 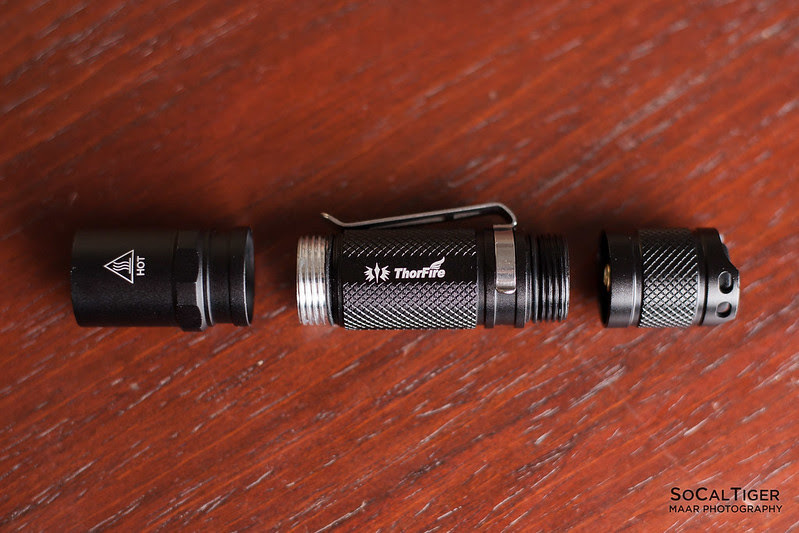 So the anodized threads are definitely a plus on this (or any other) light. I said that because i have some lights with bare aluminum threads, and when you lubricate them (silicone grease), the aluminum seems to dissolve a little and you get that grey goo as a result, which doesn’t help making it go smoother.. Candle wax works better though, but is a little hard and crumbly. 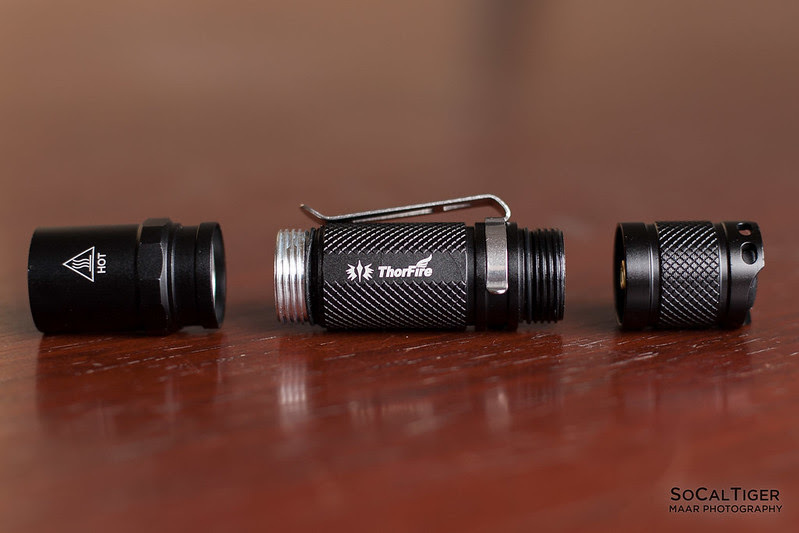 So the anodized threads are definitely a plus on this (or any other) light. That’s interesting. I know that silicone grease is a no-no because it can react with silicone O-rings but didn’t know that it could react with the aluminum as well. Are you sure that the grey goo isn’t the result of reacting with the O-rings? It’s even worse with thermal grease, like Fujik etc..
Never had any problems with O-rings though. I used to have a small syringe with silicone grease, but now i have “Yezl” silicone grease (Fasttech), which is more solid, less runny. 1) I realized that my current measurements were inaccurate due to using poor leads on my DMM. My updated numbers should be correct now. 2) I re-calibrated my output measurements so these numbers are now estimated lumens. 3) For “High”, I show both the peak output and output at 30 seconds. 4) I added % Output and % Amps columns. Use coupon code (MQHZYUZC), to get the TG06S for ONLY $10.99. Less output with protected 14500. I think that means there is no current regulation on 14500, only PWM, but basically direct drive. The XP-G2 can handle that though. Currently $9.90 on Amazon (US) after coupon code.